A silk pillow case is a fabulous luxury to have. These pillow cases have been around for centuries and were typically found in only the wealthiest of households. Today, the main reason for their popularity is because of its beauty claims. Hair experts claim that silk covers prevent frizz, split ends and stops hair from breaking off. So if your hair has been recently highlighted or overly processed, experts suggest a silk pillowcase restores smoothness and shine. Similarly, dermatologists believe that silk covers helps prevent wrinkles and reduces fine lines while you sleep. 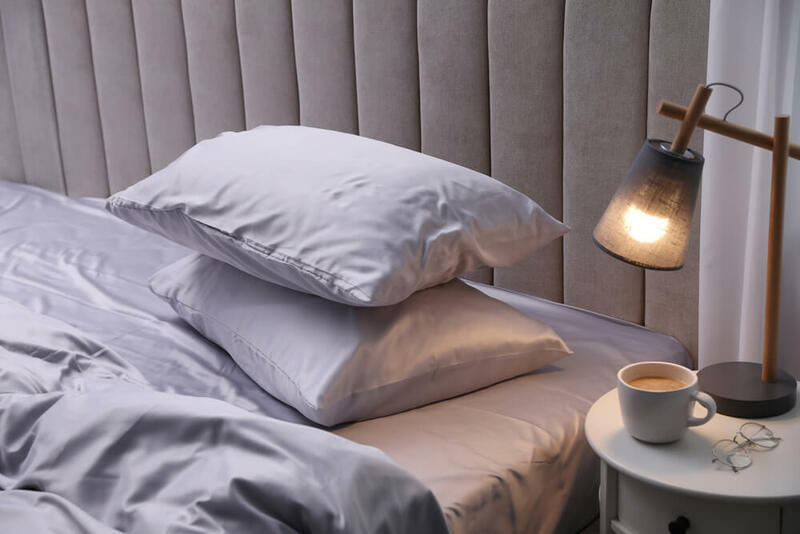 If this is the time to upgrade your pillowcase, then this article delves deep into various silk pillowcases that delivers on that ultra-plush luxury you’re after and promise not to break the bank. The following are reviews of the best pillow silk pillowcases for your skin and tresses. We start off with 2018’s list of the top 5 best anti aging silk pillowcases . If you don’t know where to start off your search, take a look at this list of silk pillowcase reviews first. This floral print silk pillowcase is the ultimate choice for luxury sleep and comfort. It is specially designed to prevent fine lines and wrinkles as you sleep and keep your hair from splitting and tangling as you indulge in the best experience. One thing you will love is the soft and cozy nature of the pillowcase. The silk pillowcase is made from 100% Mulberry silk (16mm) on both sides which is known for its premium quality and durability. The pillowcase features both sides of this premium material with a lovely drape for the style. The design also features a beautiful floral print that lasts a long time. The silk pillowcase has a hidden zipper which conceals the opening for a perfect style. The construction is of high quality, and each seam is carefully finished for durability. Since the pillowcase designs are handmade, you can be sure of outstanding quality and construction. The pillowcase is available in sizes: Queen (20″ x 30″ (51 cm x 76 cm) , King (20″ x 36″ (51 cm x 91 cm)) and Standard (20″ x 26″ (51 cm x66 cm)) and a multitude of vibrant colors and floral patterns to choose from to suit any bedroom decor . The natural silk protein ensures the skin is protected as you sleep which, in turn, results in a healthy glowing skin the next morning. More to this, the pillowcase ensures the hair retains the moisture preventing frizz and split ends. The Alaska Bear pillowcase will redefine the luxury of sleeping on a silk pillowcase. It is super soft, silky and cozy. With this, you can be guaranteed of comfort and unbeatable quality. One thing you will love about the pillowcase is its breathability feature which lacks in most others. The pillowcase is made from 100% 19 Momme Mulberry silk and features a thread count of 600. This construction delivers a robust, smooth and hypoallergenic pillowcase for your comfort. It is natural which makes it suitable to use for everyone. With the breathability feature, the pillowcase ensures you sleep cool when it’s warm and enjoy some warmth when the temperatures hit low. Silk is known for retaining skin and hair moisture, and this is precisely what you get with this pillowcase. Also, this one is great for reducing wrinkles, dry skin, frizzy hair and a puffed face when you wake up. The design of the pillowcase features a hidden zipper with strong, secure seams to last an extended period. A highly rated silk pillowcase with over 3,000 people rating it five stars, this pillowcase is another winner. Sleepers have a choice of 7 different sizes to choose from and 27 various neutral colors and patterns. It is handmade, and the making process only involves natural dyes for safety. It is indeed a piece of luxury to enjoy every night and get your beauty fix as well. Quality comes first when choosing the right set of pillowcases. This one from Fishers Finery is an awesome addition to your bedding collection with a guarantee of durability and comfort. What you can be sure to love is the high 25 momme which means the pillowcase feel more silky, soft and dense. The 100% mulberry silk pillowcase comes in the best quality you can ever ask for. It is designed carefully to deliver a soft, comfortable and luxurious piece for quality sleep. With its natural state, you can be sure of reaping health benefits including protection of the skin and hair moisture retention. The pillowcase design features an envelope flap which makes it easy to fit the pillow. It also ensures the pillowcase stays in place all through with a seamless look for the style. This pillowcase was reviewed and named Good Housekeeping‘s Tried and Tested “Winner” and “All-Star Standout”. Available in sizes Queen and King, these silk pillow covers are easy to maintain with hand wash and dry-clean options being the best. Pros: Perfect size, breathable, high-quality fabric, weighty, great for hair and skin, no pills. Silk is luxurious and what other way to enjoy the luxury than getting yourself a set of silk pillowcases. The Silk Lady case can be the perfect solution to frizzy hair, skin redness, and puffy skin. You will love the hypoallergenic nature of this case and enjoy comfort and health as you sleep. The pillowcases are made from 100 % Mulberry silk featuring a 600 thread count. They are of perfect weight, and the construction ensures they last a long time with minimal care. The pillowcases are soft and silky which makes them preferable for daily use. Sleeping on these is ultimately one of the best experiences. Available in sizes Standard, Queen and King. If you have woken up with frizzy hair and dry skin, then you should consider getting a set of the Silk Lady. They are some of the best in retention of moisture both for the skin and hair keeping you healthy as you enjoy the soft, cozy feel of the cases. In addition, the pillowcase is breathable to prevent moisture buildup and sweaty situation when you wake up. The benefits of the Celestial silk pillowcase cannot be overemphasized. With this pillowcase, you get to experience luxury every other night and enjoy top comfort and rest. What you will love about the pillowcase is the skin protection quality and moisture retention for hair, decreasing breakage and frizz and nurturing skin. The pillowcase is made from 100% mulberry silk featuring 25 momme weight. What you get is a soft, strong, and durable silk pillow cover for everyday use. It is super hypoallergenic to ensure your health is in safe hands. That is by guaranteeing optimal moisture retention and skin protection, preventing morning lines. One of the best ways to enjoy the luxury that silk brings to the table is getting a pair of these Spasilk pillowcases. They are soft and smooth on the skin and will contribute positively to the quality of sleep. One thing you will like about them is the ability to help reduce facial wrinkles by keeping the skin supple and moisturized. The pillowcases are made of 100 % premium mulberry silk which boasts of quality and durability. They are breathable and highly hypoallergenic which makes the cases suitable for use by everyone. The cases retain moisture both for hair and skin. With these cases, you can be sure you will not wake up with frizzy hair, puffy face or dry skin. One of the most important things that should be considered about the silk material is the “momme” weight. The market claims to be selling the genuine Mulberry silk while there are many other imitations of the same. Silk fabric comes from woven fibers of Bombyx mori silkworms which feed exclusively on white mulberry tree leaves. The original silk material has features some attributes that can help you differentiate from the others. It is naturally odorless and has excellent breathability features. Also, the natural silk can regulate temperature whereby it warms up while cold and cools down when the temperatures hit high. If you want the best pillowcase that is soft and gentle on both your hair and your skin, mulberry silk is your top choice. On this note, it is essential to note that some manufacturers blend the silk with other fabrics altering the natural feel of silk. Therefore, you should confirm that the pillowcases are 100 % and free from chemical treatments. Is a a silk fabric woven together with a weave that looks similar to satin and allowing for extra luster and shine on the front side in exchange for a dull finish at the back. Satin devotees prefer silk charmeuse above all other silky fabrics. When shopping for silk pillow cases remember that you are looking for charmeuse or even satin silk. Unlike other fabrics, silk fiber is thin and light. It has a sturdy texture however but is not measured by thread count. What matters is the weight. The unit of measure is known as ‘momme.’ This notes the weight of 100 yards of silk with a width of 45 inches. A weight of about 8 to 16 is appropriate for clothing while weights as high as 30 are ideal for upholstery and drapery. That means that silk bedding such as pillowcases should have more momme weight than the usual one for clothing. The best weights for what you are looking for in a silk pillow cover are in the mid to upper teens and at the higher end, the lower 20s. The ideal range for momme weight is going to be in the 16-19 range. This weight can withstand multiple washing and frequent use. The material with such a weight also resists wrinkles, withstands machine wash and lasts an extended period. Keep to a thread count for your silk pillow to above 400 or so, for that ultra smooth feeling. During the making process, the silk fibers are twisted to make threads and then woven into a piece of fabric. The weaving style that is most preferred is the Charmeuse. The weave appears as back and forth weft threads across the warp threads along the length of the fabric. This type of texture creates a uniform and smooth top which makes it best for pillowcases. When buying silk pillowcases, be sure to check the details of the stitch all around the fabric. Make sure there are no holes are or uneven sections which are signs of poor quality silk material. Also, ensure the seams are secure, and the stitches are even. Most of the silk pillowcases could be machine washed, usually on hand or a gentle wash cycle with a gentle soap. Silk is one of the premium fabrics there is, and so proper care is necessary. Experts recommend cleaning silk by hand to keep off the harsh cycles in the machine. But, as long as you follow the manufacturer’s instructions, machine washes can also work as well. On a side note, you should ensure you follow the temperature settings and the cycles to ensure your silk cases remain in excellent condition. One important factor to keep in mind is the machine setting. It is advisable to wash silk in cold or warm water not exceeding 86°F (30°C). Also, the machine should run on a delicate cycle, and silk should be cleaned separately from other fabrics. One more thing, you should use a mild detergent that is free from bleach or enzymes and indicated safe to use on silk. Another point to help you maintain your silk pillowcases in the right condition is ensuring you wash them inside out to protect the beautiful yarns. Also, you should ensure they are completely dry by air drying them. Tumble drying works as well, but you should ensure the setting are on low or no heat. With these points in mind, your luxury silk pillowcases will serve you for an extended time. Getting your beauty sleep is essential as it helps the cellular structures repair themselves. They help to keep the face healthy as you sleep. Silk is known to reduce skin’s redness, facial creasing and leaves the face less puffy. Minimize ageing. Silk pillowcases also help to retain skin’s moisture which is essential in ensuring the skin is adequately hydrated even when you sleep. Silk is naturally breathable and hypoallergenic which makes it suitable for people that have contact allergies or react to fabric processors. As good as it is to the skin, a silk pillowcase will help you retain hair’s moisture. It ensures you wake up with hydrated hair with less frizzy and split ends. Silk lasts long and in excellent condition. It is highly resistant to dust mites, fungus, and mold. This ensures you reap all the other benefits for an extended period. Silk is luxurious. After a long day at work, you want to relax and rest well on the smooth, soft and cozy pillows, thanks to the premium nature of silk. Great for hot sleepers who like a cool sleeping experience. Silk naturally regulates heat, which helps you maintain the correct body temperature. Silk pillowcases are with no doubt a useful investment and a great alternative to spending hundreds of dollars on facials and hair products. Silk is naturally temperature regulating, has moisture preservation affects on your skin preventing facial creasing and stops hair breakage. With so many assorted colors to choose from and patterns on silk pillowcases from SLPBaby, you can’t go wrong.